For all the sublime football the Chiefs, Rams, and Saints provided us this year, the most entertaining aspect of the season may have been the Baltimore Ravens’ transformation from fodder for the rest of AFC into the NFL’s scariest War Rig. They beat the Browns today, 26-24, to clinch a playoff berth, and they did it by doing the same thing that allowed them to go 5-1 in the previous six games: repeatedly running straight through the faces of opposing defenders. The Ravens ran and ran and ran some more. They finished the game with 296 rushing yards, split between Lamar Jackson and a few beefy running backs. Jackson carried the ball 20 times for 90 yards and two touchdowns, Kenneth Dixon took it 12 times for 117 yards, and Gus Edwards finished with 76 yards on 12 carries. If there was one drive from this game that sums up what kind of team the Ravens have become, it was the one from late in the first quarter that put Baltimore up 17-7. The Ravens traveled 77 yards on six plays, with 70 of those yards coming on the ground. Jackson capped it off with this neat little dash into the end zone. The Ravens finished the season 6-1 behind the strength of this option-heavy, run-first offense, with that one loss coming to the Chiefs in overtime. Their team rushing numbers in those seven games go like this: 267, 242, 207, 194, 242, 159, 296. They are flattening people, and no defense has yet figured out a way to stop them. What makes this run even more impressive is that this isn’t at all how the Ravens had planned on playing this year. 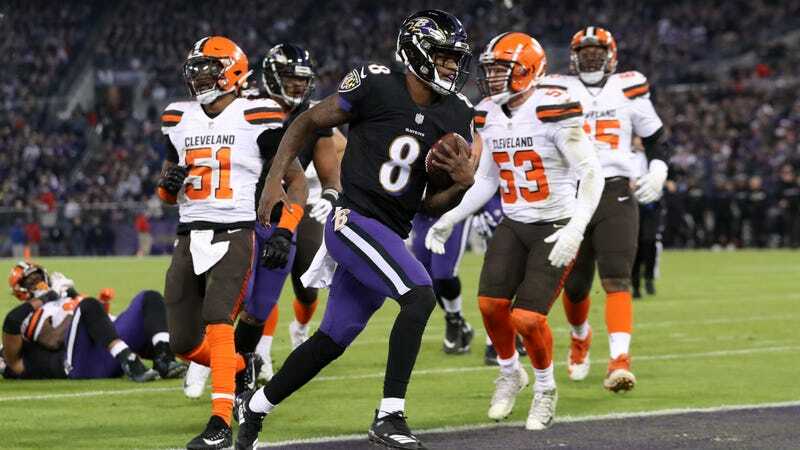 Jackson was supposed to be a longterm project, spending at least a season on the bench while Joe Flacco plodded along in a traditional offense. But when Flacco got hurt and Jackson became the starter, the Ravens had to completely rework their offense in order to maximize Jackson’s skills. He tossed just six touchdowns this year and only threw for more than 200 yards in a game one time, but the Ravens just kept winning. That’s because they were daring enough to lean on Jackson’s running abilities and turn their offense into an almost entirely ground-based attack. He finished the season with 605 rushing yards on 127 carries. The Ravens coaching staff deserves credit for even attempting such a dramatic philosophical shift in the middle of the season, but they pulled it off so well that now their team is in the playoffs. The Ravens now head into the playoffs armed with a fantastic defense and the best running attack in football, which just so happens to be led by a rookie quarterback. At some point they’ll almost certainly run into a team that will figure out a way to slow down all that rumbling and force Jackson to win a game with his arm, at which point they’ll be eliminated and every insufferable pundit in America can get back to dismissing Baltimore’s offense as “gimmicky.” It won’t matter, though, because the Ravens’ sprint to the playoffs was supremely satisfying to watch, if only because it must have been so terrible for everyone who thought Lamar Jackson should have made himself into a wide receiver.